Sweet Berry bear passed away in June 2017. Berry was a special bear and a favorite of the staff, volunteers and all the tour guests who met him. He will be so very missed! Berry the bear was born in 2001. As a small cub, Berry was taken from the wild by two young boys on one of the Indian reservations here in Arizona. When authorities figured out that the boys had a bear cub, Berry was taken to a zoo on the reservation where he was treated for malnutrition and starvation. Because of his extremely frail condition, he suffered seizures and had to be force fed by the vet and his wife. 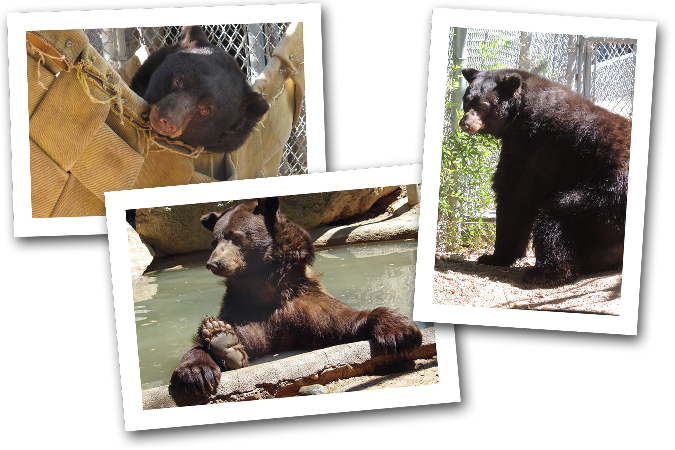 Berry’s health gradually improved and he was moved to an area with other bears. There were already two female bears at the Zoo and only one bear enclosure. Because Berry was raised by the boys, he had imprinted on humans and didn’t know how to be a bear. The female bears at the zoo began to pick on him and just wouldn’t accept him. He needed a place to live where he could feel safe and not be frightened of the bigger bears. Southwest Wildlife was that place. SWCC was, and still is, the only accredited wildlife sanctuary in Arizona with the facilities to care for large mammals, such as bears. Berry loved to show off and get a special treat from the tour guides. In the warmer weather, Berry could often be found bobbing around in his filtered swimming pool or lounging on top of his rock waterfall. During cooler weather, sometimes even the promise of a favorite goodie was not enough to entice him from his den. It was always entirely up to him whether he chose to interrupt his nap to come out and visit.